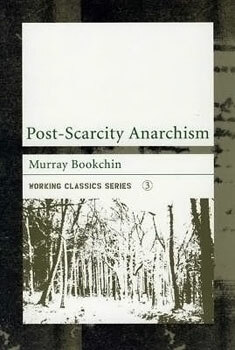 Murray Bookchin's collection of essays envisioning an anarchist society without scarce resources, if we rely on technology. We got an e-mail saying this book is only half complete. Is this correct? Or were there two different versions published? My hardcopy of this book is 197 pages and it's from AK press. So, I think the answer is yes, Steven. Now I'm curious as to what's in the other 118 pages. My Ramparts Press version (1971) has 288 pages... seems to be the same contents as the Black Rose edition.